Officials are working to make bicycling through the community easier. 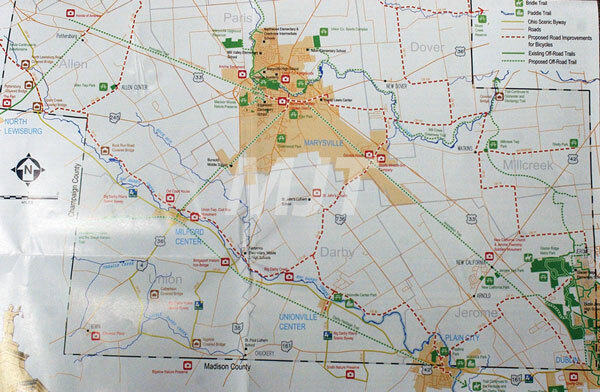 At a recent meeting, Shawn Sech, director of Health and Planning for the Union County Health Department, laid out a plan to connect Marysville’s Jim Simmons Trail to the Heritage Trail in Hilliard. Sech explained that in 2013 and 2014, the Union County Chamber of Commerce developed and published a Master Trail Plan. Part of the plan was the creation of a trail connecting Marysville with the Heritage Trail in Plain City, which connects to Hilliard. In 2017 the county received a grant from the Ohio departments of health and transportation. Initially the grant was only to fund a $15,000 bike rental program. Eventually the funding was increased to $70,000 and shifted to fund a bike trail from Schwartzkopf Park to the Heritage Trail. “It seems like a lot of money, but when you are talking about trails, it’s really not much of anything,” Sech said. She explained the money will be used to create signage and road markings along the already existing roads. She said the growing cycling community already uses several roads in the county to connect to Plain City. “It’s not creating any trails or widening any roads,” Sech said. She said the money will be used to post a variety of “Share the Road and Bike Route” signs along the more rural roads. Health Department officials have been working with Plain City, Marysville and Madison and Union counties to finalize a 19 to 20-mile route. Once on the Heritage Trail, cyclists have access to many other trails traveling across the state. Inside Marysville, the money will be used to post signs and create pavement markings to warn drivers and direct bicyclists. In Marysville the bike route will run from Schwartzkopf Park, south on Maple Street to Sixth Street, east to Chestnut Street which becomes Weaver Road. She said active transportation has health, economic and generational preference benefits. Sech said the adult obesity rate in Union County is higher than the state or national average and children are at greater risk of cardiovascular related diseases at greater rates than previous generations. She also said many people cannot afford a car and if they can, they cannot afford the gas, maintenance and insurance to operate it regularly. Sech explained that many people, especially younger people, want to live in a connected city. “Millennials coming into our community prefer to come into a walkable or bikeable community,” Sech said. He said the state inspects and licenses golf carts and permits them on roads with a speed limit less than 35 miles per hour. Marysville, however, does not permit golf carts on city streets. Council member Scott Brock said it might be time to look at the law again. Brock, who represents Mill Valley, said he has had several residents ask him about golf carts. While he said he wants to use a golf cart, Powers urged council to consider rules on who could use the carts and where. He said he wouldn’t want to see “a bunch” of golf carts in the Uptown. He also suggested an age limit for who could drive the golf carts.